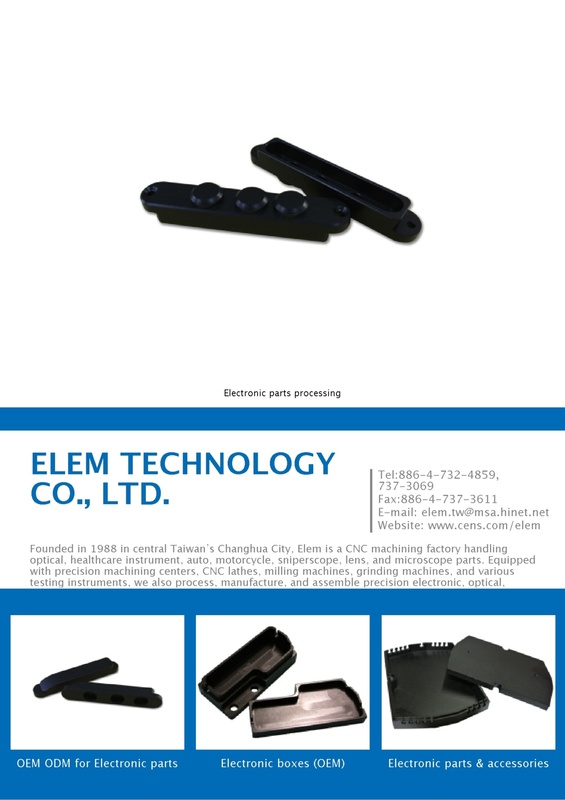 Founded in 1988 in central Taiwan’s Changhua City, Elem is a CNC machining factory handling optical, healthcare instrument, auto, motorcycle, sniperscope, lens, and microscope parts. Equipped with precision machining centers, CNC lathes, milling machines, grinding machines, and various testing instruments, we also process, manufacture, and assemble precision electronic, optical, mechanical, and hardware components. Focusing on R&D, production management and zero-defect QC, we maintain consistent quality. ISO 9001-certified, and approved by Olympus and Asia Optical as subcontractor, we offer reasonable prices, on-time delivery, and expertise to fully satisfy customers.